Partly cloudy skies this evening will become overcast overnight. Low 52F. Winds light and variable.. Partly cloudy skies this evening will become overcast overnight. Low 52F. Winds light and variable. 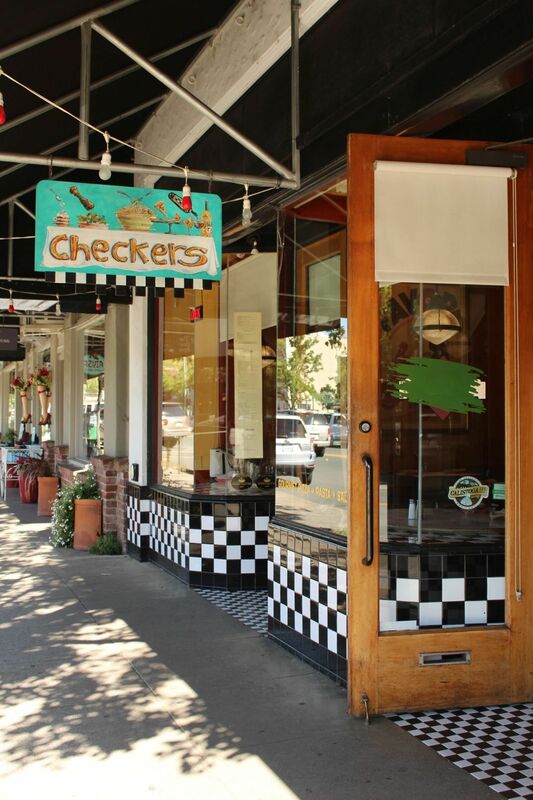 Checkers Restaurant is located at 1414 Lincoln Ave. in Calistoga. In December 2016, Clif Family Winery was named Business of the Year. Here owners Kit Crawford and Gary Erickson, front right, pose with their staff at Velo Vino. Napa Valley Restaurant Week, Jan. 20-27, takes place during Cabernet Season, November through April, allowing locals and visitors to dine throughout the valley and experience the region’s food and wine culture at a fixed price. Multi-course prix-fixe menus are offered for both lunch ($20) and dinner ($36 or $46), allowing guests to experience the latest culinary hot spots or revisit old favorites. Regional farm-to-table practices and Michelin-starred restaurants make the Napa Valley an epicurean destination, and there’s no better time to enjoy the region’s culinary scene than during Napa Valley Restaurant Week. Each of the more than 30 participating restaurants has created menus that celebrate the season, and many also offer optional Napa Valley wine pairings. Participating restaurants include many of the most iconic and popular destinations throughout the valley, including Angele, Charlie Palmer Steak, Compline and TORC in Napa; Mustards Grill and Bistro Jeanty in Yountville; the Michelin-starred Auberge du Soleil in Rutherford; Brasswood and Tra Vigne Pizzeria & Restaurant in St. Helena; and Evangeline, Solbar and Lovina in Calistoga. To view the complete list of restaurants participating, visit visitnapavalley.com/restaurant_week. The Michelin-starred Restaurant at Auberge du Soleil presents a two-course lunch for $20, featuring an inspired menu utilizing ingredients sourced from local and regional purveyors, with an optional wine pairing from one of most extensive wine cellars in Napa Valley. The Restaurant at Auberge du Soleil offers views of the valley floor from its dining room or terrace. Available Monday through Friday, advance reservations recommended. Acacia House at Las Alcobas offers a three-course dinner for $46 honoring the wine country region with unique regional wines complemented by local, sustainable menus created by Top Chef alum Chris Cosentino. Brasswood Bar & Kitchen offers a $46 three-course dinner featuring a signature menu. Wine pairings are optional. Clif Family Wines offers a $20 three-course lunch at the celebrated Clif Family Bruschetteria Food Truck parked alongside the tasting room on Main Street in St. Helena. The three-course lunch includes a small salad or seasonal soup, followed by a choice of Bruschetta from the menu, with a Chocolate Chip-Hazelnut Cookie or THCO Chocolate Budino. Clif Family wines are available by the taste; glass; flight or bottle for additional purchase. Available Sunday, as well as Tuesday through Sunday from 11:30 a.m. to 4 p.m., closed on Monday. Tra Vigne Pizzeria and Restaurant offers a two-course lunch for $20 or three-course dinner for $36. Lunch includes a choice of red kale salad or minestrone soup, followed by a choice of C&B burger or chicken panini sandwich (both offered with fries). Dinner includes the original Tra Vigne Mozzarella al Minuto; followed by mixed greens with Piave cheese; finished with rigatoni bolognese. Dessert may be added to lunch or dinner for and additional $5. Tap wines are offered at $7 per glass with the purchase of any Restaurant Week menu. Not available for take-out. All Seasons Bistro offers a two-course lunch for $20 as well as optional “Happy Hour” pricing on selected beer, wine and cocktails. Bosko’s Trattoria offers a $20, three-course lunch featuring fresh, home-style Italian foods served in generous portions including thin-crust wood fired pizza and made-from-scratch pastas. Café Sarafornia offers a two-course lunch for $20, featuring classic diner fare. The 125-year-old Calistoga Inn, a landmark restaurant and brewery, offers a two-course lunch for $20 and three-course dinner for $46, featuring California/American cuisine with a focus on fresh, organic, farm sourcing. The Inn’s brewery, the Napa Valley Brewing Co., was the first established brewery in the Napa Valley after Prohibition. Checkers offers a two-course lunch for $20 and three-course dinner for $36, featuring a variety of creative salads, thin crust pizzas and pastas. Evangeline offers a multi-course dinner for $46 featuring casual French bistro cuisine with a Creole soul. Optional wine, beer and cocktails are available to complement the meal. Hydro Grill offers a three-course dinner for $46 featuring a selection of items from their seasonal menu. Special pricing on wines by the glass and $5 corkage during Restaurant Week complete the offer. La Prima Pizza offers a two-course lunch for $20 and three-course dinner for $36. Lovina offers a two-course lunch for $20 and three-course dinner for $46, featuring locavore, American fare in a casual dining environment. Solbar at Solage offers a special Restaurant Week lunch for $20, featuring chef’s choice seasonal menu with dessert.